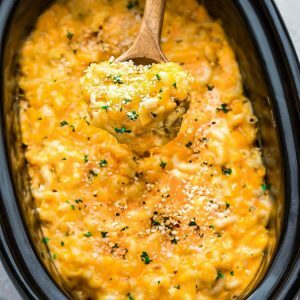 Slow Cooker Macaroni and Cheese made entirely in the crock pot is creamy, comforting and perfect for potlucks, camping and parties. Best of all, no boiling or layering required for this easy one pot recipe — even the pasta cooks right in the same pot! Once fall rolls around, hearty comfort foods happen regularly around here. And I can’t think of anything more comforting to my kids, than a classic baked macaroni and cheese. This Slow Cooker Macaroni and Cheese cooks up super creamy and comforting. And the best part is how easy everything comes together in the crock pot. Since this is a no boil crock pot macaroni and cheese recipe, I love that you don’t have to dirty up an extra pot to cook the pasta. Plus, it leaves your stove free if you need it to make any other side dishes or your main course. 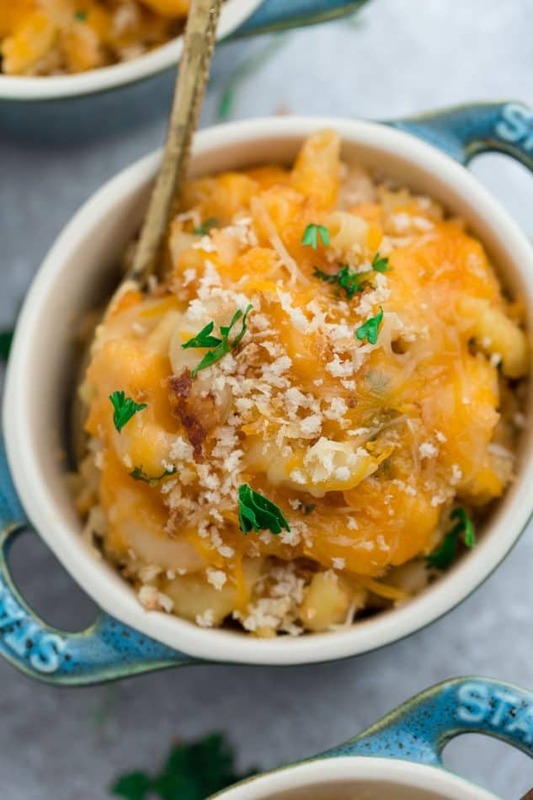 WHAT CHEESE MAKES THE BEST SLOW COOKER MACARONI AND CHEESE? There are so many slow cooker macaroni and cheese recipes out there that call for Velveeta, American cheese and condensed cheddar soup. So I seriously ended up testing this slow cooker mac and cheese recipe more than a dozen times just to get the consistency right. Now, I normally don’t use condensed soups but in the end, the condensed cheddar cheese soup produced the creamiest results WITHOUT having to boil the pasta first. 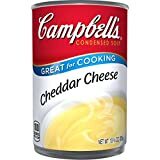 However, if you are NOT a fan of using cheddar cheese soup, feel free to swap it out with another cheese – cream cheese or Velveeta. I can’t guarantee the texture will remain the same though. 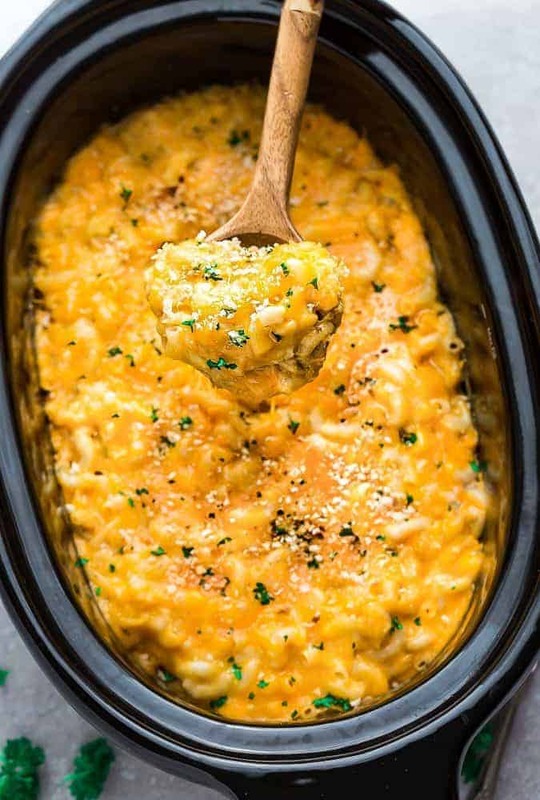 Or you can even try to make this crock pot macaroni and cheese recipe using a homemade version of condensed cheddar soup if that’s what you prefer. Just melt some cheddar cheese with butter and flour and then add it to the slow cooker. But like I mentioned, I tried to keep this crock pot macaroni and cheese a truly easy dump-and-go one pot recipe this time. So everything cooks right in the slow cooker – even the pasta. And, you can certainly boil the pasta first if you prefer but I chose to keep things simple by throwing the uncooked macaroni together with the rest of the ingredients. For the cheeses, I used sharp cheddar, Mozzarella and added some Provolone near the end. WHAT PASTA IS BEST FOR NO BOIL CROCK POT MACARONI AND CHEESE? I originally tested this recipe out using dry elbow macaroni and cheese but I later found that dry Cavatappi pasta (corkscrew shape) works SO much better in the slow cooker without turning mushy. So I updated the recipe and HIGHLY recommend seeking out Cavatappi (or Cellentani) pasta if you can. If you can’t find it, then dry elbow macaroni will still work but you may have to adjust the liquid depending on how hot your slow cooker runs. Start off by lightly coating a 5-6-quart slow cooker with non-stick spray. Add the Cavatappi pasta to the slow cooker. Dot with cubed butter then stir in the condensed cheddar cheese soup, half and half cream, shredded cheddar, shredded Mozzarella, sour cream, salt, black pepper, mustard, garlic powder, cayenne pepper, Worcestershire and evaporated milk. Stir to combine, making sure that the pasta is covered in as much liquid as possible. Cover and cook on low heat (about 1½ – 2½ hours but total time will vary according to your slow cooker – mine was done at 90 minutes). Check pasta after 30 minutes and stir. Cover and continue cooking. Check and GENTLY stir sides every 30 minutes until pasta is tender and liquid is thick and creamy. Top with Provolone cheese and remaining ½ cup of shredded cheddar cheese. If the mixture is too thick, add more milk as needed. Turn off slow cooker and cover for an additional 10 minutes, or until the cheese has melted. Serve immediately with freshly chopped parsley and toasted panko crumbs, if desired. Transfer any remaining pasta from the slow cooker into a separate casserole dish or pot. If any pasta is left in the slow cooker, even when it’s off, it will continue to cook and dry out. 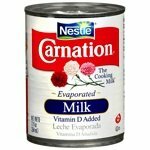 Heat any leftovers on low (either on the stove or slow cooker) and add more milk as needed for a creamier consistency. Different slow cookers vary by brand and size and each one cooks at a different heating level. 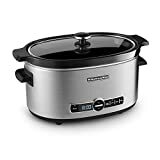 I use this 6 quart slow cooker which I find cooks evenly. No matter which model you use, be sure to keep your eye on this dish and stir often so the pasta cooks evenly. Just for reference, my macaroni and cheese was perfectly al dente around 90 minutes in a 6-quart cooker. HIGHLY recommend using dry Cavatappi (or Cellentani) – the corkscrew shape and size work so much better in the slow cooker without turning mushy BUT if you can’t find it, then dry elbow macaroni will still work but you may have to adjust the liquid depending on how hot your slow cooker runs. Use a cheese grater to shred fresh cheese rather than using pre-shredded cheeses. Pre-shredded cheese have a chemical in them to prevent the cheese from clumping in the packaging. That chemical also prevents the cheese from melting well. Once your macaroni and cheese is finished cooking up – be sure to serve the entire batch or scoop everything out of the crock-pot into another casserole dish. This prevents the mac & cheese from overcooking and drying out. Serve hot with some freshly chopped parsley and toasted panko crumbs. 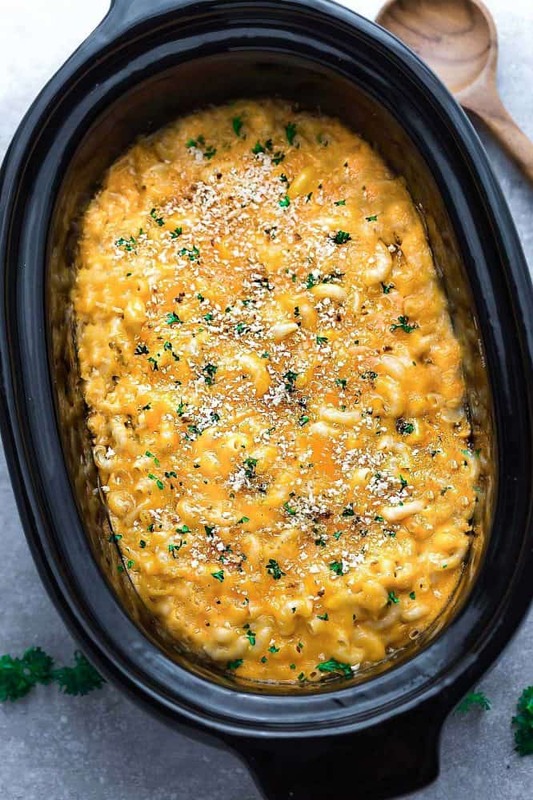 This crock pot macaroni and cheese makes the perfect easy side dish for Thanksgiving potlucks, Christmas, camping or those busy days when you don’t want to be tied down in the kitchen. 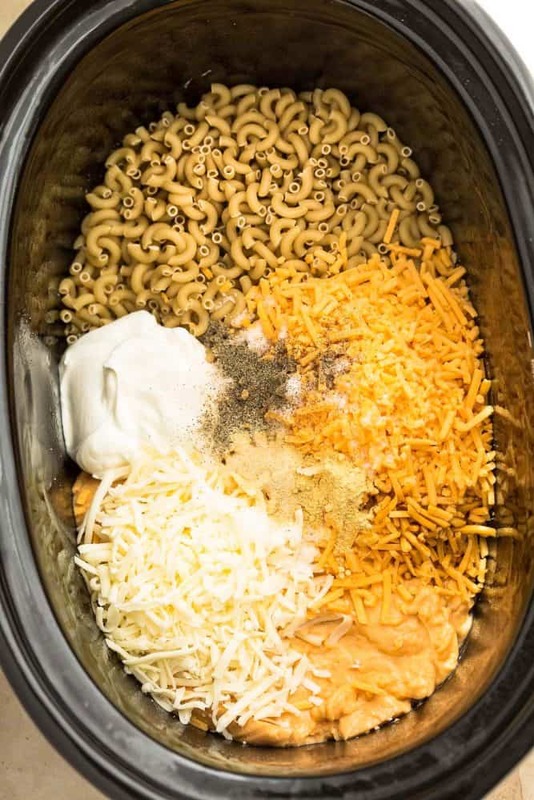 Crock Pot Macaroni and Cheese is creamy, comforting and perfect for potlucks, camping, and parties. Best of all, no boiling or layering required for this slow cooker recipe — even the pasta cooks right in the same pot! Spray a 5-6-quart slow cooker with non-stick spray. Add the dry pasta to the slow cooker. Dot with cubed butter then stir in the condensed cheddar cheese soup, half and half, shredded cheddar, shredded Mozzarella, sour cream, salt, black pepper, mustard, garlic powder, cayenne pepper, Worcestershire and evaporated milk. Cover and cook on low heat (about 1½ - 2½ hours but total time will vary according to your slow cooker - mine was done at 90 minutes). Check pasta after 30 minutes and stir. Cover and continue cooking. Check and GENTLY stir sides every 30 minutes until pasta is tender and liquid is thick and creamy. Top with Provolone cheese and remaining ½ cup of shredded cheddar cheese. If the mixture is too thick, add more milk as needed. Turn off slow cooker and cover for an additional 10 minutes, or until the cheese has melted. Transfer any remaining pasta from the slow cooker into a separate casserole dish or pot. If any pasta is left in the slow cooker, even when it's off, it will continue to cook and dry out. This is an amazing recipe. How about the Instant Pot version? Can you post that too?? You can substitute the condensed cheddar cheese soup with a bar of cream cheese… that will give it a great creamy consistency too! So good! Loved it! thank you! A keeper! Use the Cavatappi pasta recommended – not the elbow – so good!! Loved this so much! Thank you for the great recipe! Yum! A new solid recipe. Thank you! This is the creamy mac and cheese I have been looking for all my life most are dry and pasty but this one I won’t make any OTher mac and cheese again. thank you for sharing such a gem.